One of the hold ups on the Grandpa Cardigan was that I wasn’t feeling it. The other hold up was that I had messed up just one 4 stitch cable and wanted to go back and fix it. Despite the fact that it was an easy fix, I had to muster the energy and motivation to get it done. I mustered the motivation to find double points for the repair, and brought the project along with the double points to work. Bringing it to work and leaving it there makes it so that at least an hour a day, 4-5 days a week, I can make some progress. This is often a fabulous way for me to jump start a lagging project. Soon I’ll realize I was closer than I thought and I’ll bring it home for the final push to finish. An odd thing happened when I took lunch. You see, I sit at my desk in front of my computer watching netflix and knitting most days for my break. And I picked up my project, and just then noticed that Umme Yusuf posted a link on the book of faces. 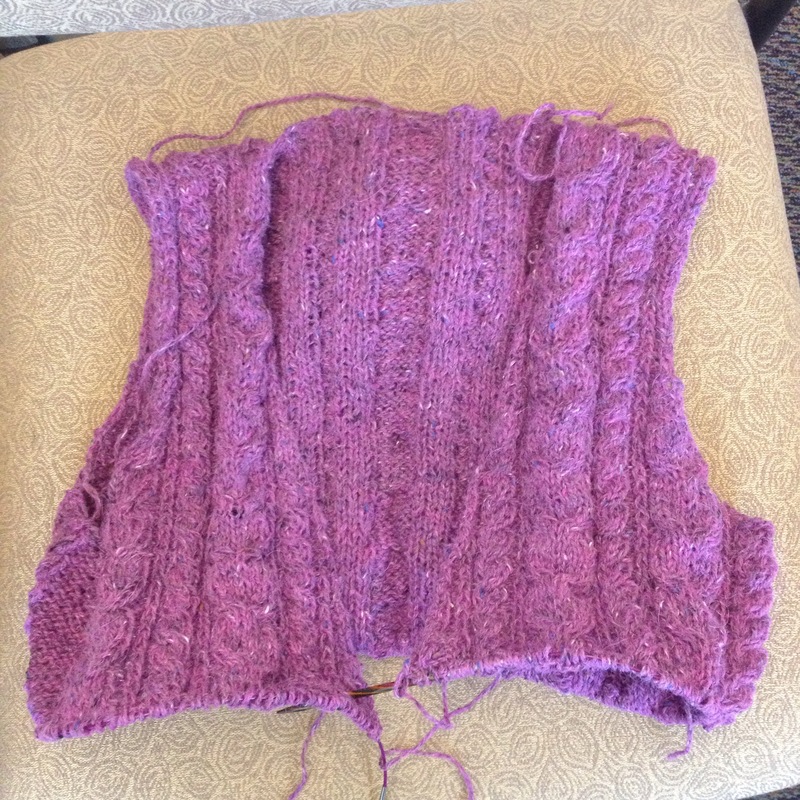 You may remember that she and I were doing KAL with this cardigan, and I knew she was quite close to a finish so I clicked on that link and read about her finished object. What a fun coincidence. So, I figured since she is done, I should take a picture of where I am right now. And really, it’s not that far. But, it contains a repaired cable and a little progress. And I’ll call that win, and her finish I’ll call my inspiration. I’m glad that my FO could be of inspiration. Yours is looking nice, such a lovely color.